There is always a lot of precautions once can take to avoid formation of ice dams. However, it is always the other way, to get the frozen gutter cleared, that everyone will be interested in. No method of preventing ice dams is totally fool proof. Here are some ways used as Gutter Ice Melting techniques. It is always preferred and advised that a frozen gutter be treated by an expert. There are companies which are experts in clearing gutter ice. Melting ice gutters should be a patient process. Applying force is not an option. Professionals usually use the steaming method. In this, the ice is melted by application of hot water and steam. This is most efficient remedy for clearing the ice. However it is costly and involves lot of labor. And moreover, it is not a permanent solution. This is preferred by professionals. It is recommended to use roof heating systems which will prevent the water from freezing in the first place. There will be no more frozen gutters. There are methods using ventilated attic, electric heating points, you can achieve this. This is the most common method and home remedy used for melting ice gutters. Some salts including Calcium Chloride is used for melting the ice. Salts make the ice melt thereby clearing the blockage in gutters. Lately, there has been increasing number of installations of nylon gutter guards. They are helpful in preventing gutter ice. They cover gutters from ice and do not let ice to cling on to roof. There are many ways people advocate that you can avoid formation of ice dam. One is isolation of attic. It is the heat which is leaked from your living room which causes water to melt at the bottom of ice layer. This will in turn result in shingle leakage. 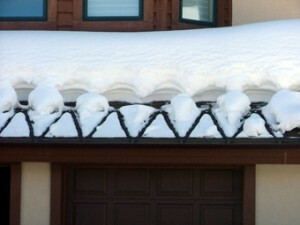 Heating the attire to prevent formation of ice and installation of gutter guards can help in prevention of ice dams. Even though it looks very simple, applying force to clear ice from roof and gutters is absolutely a no. By using tools like axe and hammers to clear off ice, you will be causing more damage to roof and gutter. Using a ladder to reach gutters can cause damage and bending of gutters. Many advocate using of Calcium Chloride to clear gutters. Although it might work very effectively in melting the ice, it has its own side effects. These salts are corrosive in nature and can corrode the gutters along with melting ice gutters. Even with plastic gutters, nails can get rusted soon. Rock salts can leave stains on roofs and gutters. Also, it is best to keep the gutters clean from leaves soon after fall. Leaves can cause blocking and will be double trouble to treat. It is only through salt application and steam / hot water treatment that iced gutters can be treated. Using a proper insulated roof and heated roof can prevent formation of ice dams in the first place.